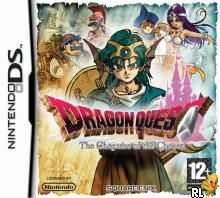 A group of individuals with seemingly nothing in common must join together for an epic quest in the first Dragon Quest saga for Nintendo DS. The honored army captain, the fearless princess ready to escape the castle, the merchant with dreams of his own business, and two sisters bent on avenging their father's death. This is the group that destiny has brought to you, the hero. Experience a riveting, chapter-driven storyline told through the eyes of the different characters. Travel through an amazing 3D world that explodes across two screens. Encounter newly animated monsters, meet diverse characters, and unravel an ancient mystery through the wireless Chance Encounter Mode. Now you can add videos, screenshots, or other images (cover scans, disc scans, etc.) 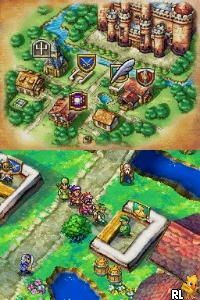 for Dragon Quest - The Chapters of the Chosen (E)(EXiMiUS) to Emuparadise. Do it now!